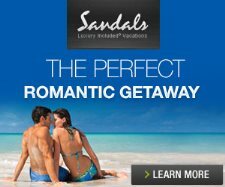 Sandals Resorts are popular luxury couples-only all-inclusive resorts in Antigua, Bahamas, Barbados, Grenada, Jamaica, and St Lucia. Each resort features gourmet dining, luxurious accommodations, fantastic service, extensive activities & entertainment, complimentary wedding packages, and complimentary anniversary or honeymoon packages. Couples of all ages enjoy Sandals romantic getaways and relaxed atmospheres. Each resort is strictly limited to couples-only and a guest minimum age of 18 years old. Save up to 65% plus, up to $1,000 Air Credit, Free Nights & Spa Credits Selected Accommodations. Which Sandals Resort is the Least Expensive? DML Vacations is a leading seller of Sandals resorts and we visit each location and destination on a regular basis. Our highly qualified certified specialists can assist in answering all questions, help determine the best resort, and find the best value based on your interests and vacation desires. Based on our strong contact with management and our never ending commitment of superior personal customer service, you can be confident that booking through DML Vacations is the absolute best way to book your vacation. Which Sandals Resort has the best beach? Least expensive resort? Best nightlife? Which resorts have swim-up rooms? Resort comparisons and 'Best of the Best'. What does Concierge Service include? What is Butler Service? What factors determine the various room category pricing? What is included with Sandals all-inclusive packages? Up to 65% Off and up to $750 Booking Bonus!